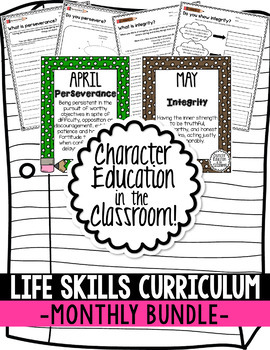 Teach your students important life skills with this Character Education in the Classroom MONTHLY Bundle which includes 10 classroom posters and 20 printables for students. 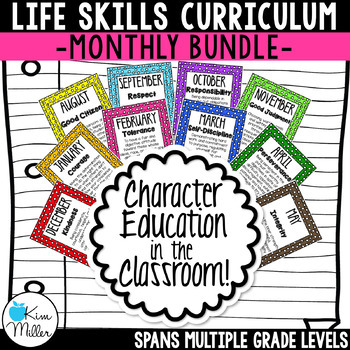 This product includes a character trait for each month (10 in all), description of the trait, and 2 worksheets to reinforce the character trait lesson. 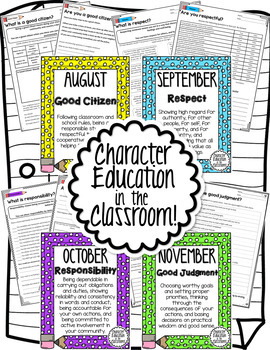 These character education posters are the perfect addition to any classroom! Colorful and useful, these posters are an excellent way to visually reinforce character education throughout the year, and this product spans multiple grade levels. Each character trait comes with 1 poster and 2 worksheets. 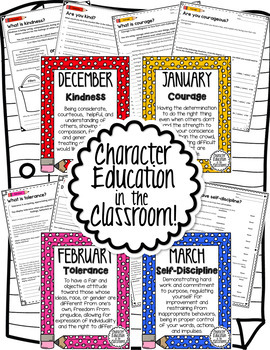 If you would rather not have the monthly header at the top, check out my Character Education Year Long Bundle at the link below. *NOTE: This product includes the same posters and worksheets as my Character Education in the Classroom - Year Long Bundle. This is the SAME product, but WITH the monthly themes…and of course, this one comes with a NEW LOOK! These character trait lessons can also be purchased individually WITHOUT monthly headers. Click on the green ★ to follow my store and get notifications about new resources and freebies! Thank you for visiting my store! Happy Teaching! Copyright © Kim Miller (For a Love of Teaching). All rights reserved by author. This product is to be used by the original downloader only. Copying for more than one teacher, classroom, department, school, or school system is prohibited. This product may not be distributed or displayed digitally for public view. Failure to comply is a copyright infringement and a violation of the Digital Millennium Copyright Act (DMCA). Clipart and elements found in this PDF are copyrighted and cannot be extracted and used outside of this file without permission or license. Intended for classroom and personal use ONLY.